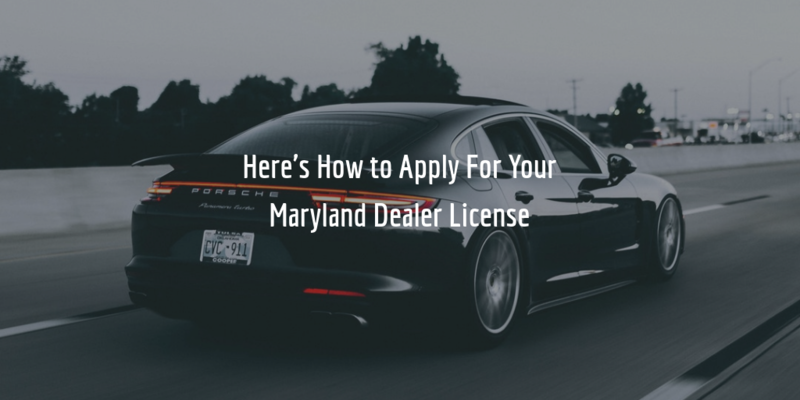 Maryland has one of the most straightforward dealer licensing procedures in the country. Getting a license includes submitting several different forms, along with an auto dealer bond. Follow our summary of the process below, and you will be well on your way to obtaining a license hassle-free. If you are interested in a wholesale dealership, it’s important to note that such dealers are only permitted to purchase vehicles from the public, but selling them to the public is illegal. All of their sales and exchanges may only come from other dealers. The state of Maryland requires new and used vehicle dealers to have locations suitable for retail activities. Wholesale Dealers, on the other hand, can operate just from offices. You can learn about the specific requirements that your location and office need to comply with by reviewing Chapter 11.12.01, Sections 03-05 of the Code of Maryland (COMAR). These are the most important requirements you will need to comply with and complete in order to get licensed. Once you have completed them, you will need to pay a licensing fee of $450 and submit your application to be processed. Licenses are issued for two years after which you must renew your license before it expires. The MVA typically sends out a renewal packet about 60 days prior to expiration which includes all the necessary forms and details about renewing. Learn everything about getting licensed as an auto dealer in Maryland by downloading our FREE ebook guide! All motor vehicle dealers are required to be properly bonded. Dealer bonds are a type of surety bond that is not to be confused with insurance policies. Unlike insurance, which protects your property, the auto dealer bond serves as a guarantee that your business employs ethical operational practices and complies with state laws and regulations, such as the Code of Maryland. In case of a breach of terms, a legal process is triggered resulting in an obligation for you and the surety with which you have underwritten the bond. The amount of your bond will depend on the type and number of vehicles you plan to sell in the coming year. The exact amounts of the bonds depending on the number of vehicles projected to be sold can also be found in your dealer application packet. To get your bond, you will need to pay a certain cost, also known as a premium. The cost of your bond is determined primarily by your personal credit score as well as certain other financial factors. The higher your credit score is, the lower your bond premium will be. The annual premium for applicants with a high credit score (700 FICO or above) typically ranges between 1% and 3% of the total bond amount. You can get an estimate of the cost of your bond by using the surety bond cost calculator below!